I have some friends (really) who, after having lived overseas, are now moving to Oklahoma. The husband is originally from Oklahoma, but the wife is from California. Despite all my goings on about how good Oklahoma is, I know that it isn't really "the cultural center of the universe", as Hoyt Axton once said (in a Pizza Hut commercial). But I digress. 1. We are not from the “South”, however, we identify with them more than we do “those Yankees”. 3. Determining your children’s fate (that of being Okies) is not necessarily a bad thing. There are many great Okies. Your husband is one of them. 4. 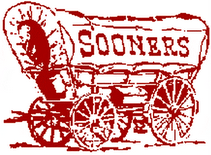 “Sooners” is now a term of respect and awe; not of derision and scandal. Learn that lesson quickly so as to not offend. 5. Local Oklahoma politicians are still Democrat; old fashioned democrats who are considered conservatives. You can’t really trust the local Republican politicians, as they are liberal. Now, on the national scale, it is kind of backwards. I think most Oklahoma democrats are actually just republicans waiting for everyone else to make the move to the “other “ party. 6. Stay away from mobile home parks in storms. They are simply “Tornado Bait”. 8. When Okies first went to California, they were looked down upon. I think you will be treated well in the reverse. 9. Buying your clothes at Wal-Mart and Penny’s is not a sign of being gauche; it is a sign of wise spending. 10. If you really want to impress folks at a party you are hosting, be sure to serve L’il Smokies. I hope you learn a little bit about Oklahoma here, or what we like to call "God's Country". One of my old bosses referred to Norman as God's country, but I think that will apply for the entire state.